This is a sibset which has been in the news recently for sad reasons, because their father Jim Stynes passed from cancer on March 20, aged 45. James or Jim was born in Dublin to Brian and Teresa, one of six siblings. His grandfather Joe was an All-Ireland Gaelic footballer with Dublin in the 1920s, and Jim followed in his footsteps, becoming a successful Gaelic footballer while still a teenager. His younger brothers Brian and David were also footballers. Jim Stynes emigrated to Australia at the age of 18 to play Australian rules football. He played 264 games with the Melbourne Football Club, including a league record of 244 consecutive games, and was the only non Australian-born AFL player to win the prestigious Brownlow Medal. He was inducted into the Australian Football Hall of Fame in 1991. When his football career ended, Jim chose to put his energy into charity, setting up a foundation to help young people, and authored self-help books for children. He sat on several government advisory boards to do with youth issues, and also became President of the Melbourne Football Club; his fundraising efforts brought the club out of debt. He won the Australian Sports Medal, the Centenary Medal, and was named Victorian of the Year in 2003. He was awarded the Medal of the Order of Australia, named Melburnian of the Year in 2010, and was awarded an honorary doctorate by the Australian Catholic University in recognition of his social work. He was honoured with a state funeral on March 27; the service was shown on screen in Federation Square since there were thousands of fans who couldn’t fit into the church. Jim’s life was short, but he packed an enormous amount into it. Jim’s wife was Samantha “Sam” Ludbey-Stynes, who was originally a schoolteacher. 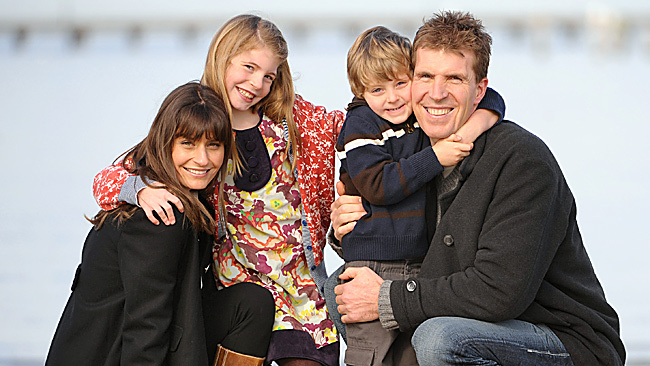 After Jim’s cancer diagnosis in 2009, the family went on a strict anti-cancer diet, and Sam is currently the Managing Director of Non-Fiction Foods, which produces Jimbo Super Muesli, to a recipe Jim created himself. Matisse is still a fashionable girl’s name, and Tiernan is a Gaelic surname meaning “lord, master” – a nod to Jim’s Irish origins. At his funeral, Jim’s family thanked Australia for giving Jim so many opportunities he wouldn’t have received in Ireland, but as often happens, Jim gave us much more in return. So sad! I’m sorry his family lost such a beloved member.